4 bedroom and 3 full bath with 2600 square feet of living space. Welcome vacationers. We are excited to have you come stay. -	*You will have some great information for your decision. *Please ask us to clarify via "Ask the Owner a Question" or Inquiry, on HomeAway before requesting to book our lovely home. * We are Mission Beach residents living nearby and personally greet you upon your arrival and give you the lay out of the rental and information about our community. *This home is a 2nd and 3rd floor vacation home, with an amazing view of the water and beach that will awe you. We are located in a Quieter combined neighborhood community of Vacation Rentals and Residents. We respect our community and their right to a peaceful neighborhood. Should you want a place for gathering of friends other than the listed guests on the contract, another choice will be a better suited for your vacation. If you are looking for an amazing home for your family or guests listed on the contract, this will be a wonderful choice. Note: Our home is best suited for mindful, low key, respectful guests who want to share an amazing vacation together. It would not suit anyone wanting a more party or loud experience for their vacation or invite extras guests over to use the home during their stay. Only guests listed on the contract may occupy the home at any time. Please ask us about our policy, we are happy to go over its meaning and answer any questions you might have. ~An agreement will be sent direct from owner/Manager to you and must be completed and returned directly to owner/Manager before any reservation will be confirmed. A government ID is required to match (renter, payee, contract signee) All adults 18 years of age and older must be emailed a copy of the agreement so they have the information as well. The contract is due within 48 hours of the reservation. Our property is listed on multiple sites, for consistency, the polices, terms and conditions listed on this contract/document sent by us directly, shall prevail and supersedes any and all other polices, terms and conditions described on the listing and booking site that you originally inquired and/or booked this property. ~We ask that you read the entire website before requesting to book, so you are aware of the information. This home and neighborhood best suits low key vacationers who want a beautiful home on the Beach front bayside. We want to assure you are 100% satisfied with your choice. We take all reservation from Homeaway/VRBO via the HomeAway platform. ****PARKING - We have two reserved parking spaces dedicated to this rental that will accommodate your 2 mid-sized or smaller sized vehicles. Please inquire about our parking requirements when you email or call for your reservation. If you have a large vehicle you will be required to use both spots for the one vehicle or park off site. We own and manage several properties, and care about the personalized experience we provide for you. We are close to Sea World, The San Diego Zoo and LegoLand. The Great Blue Heron - Lovely 4 Bedroom 3 Bath - Large, 2600 sq ft located in Mission Beach bayside. This rare find does sleep 12 in regular beds with a maximum occupancy of 12 people total. 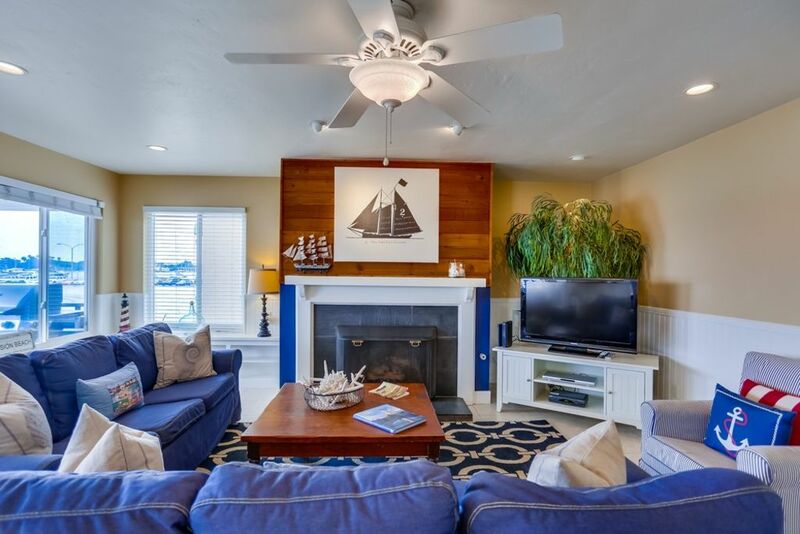 Come and Experience this exceptionally large waterfront 4 bedroom beautifully remodeled bay front beach rental with 2600 square feet of living space for your vacation enjoyment. The location on the quieter side, the Bayfront provides a wonderful atmosphere for vacationing in San Diego. The Great Blue Heron is the perfect choice for your large families and reunions, as it will accommodate up to a maximum of 12 people for the home. Tastefully decorated in nautical cottage interiors with all new kitchen and granite counters along with Pottery Barn style furnishings add that extra touch for a true beach feel and experience. Renting this beach accommodation, will delight and pamper your guests after a long day playing at the beach. With San Diego's notoriously perfect weather (practically), visiting the beach can be a wonderful experience any time of the year. This vacation home occupies the 2nd and 3rd floor levels of the building. You and your guests will have years of memories and fun filled stories about your stay in Mission Beach at The Great Blue Heron. Your vacation rental sits on the gorgeous and peaceful beach front with a delightful view of the glimmering water outside your door at the beach. Each morning the sun elevates itself above the horizon to cast it's first morning light across the shimmering waters for your pleasure. In the summer season, each night, you have front row seats to experience Sea World's nightly fireworks display. Mission Beach is unique in that it sits on a peninsula with both the bay and the ocean. The Great Blue Heron is at the narrowest part of that peninsula, which makes it the ideal location. Imagine sitting on your balcony with a cup of coffee watching the sunrise over the water, or in a minute walk across the street to watch the waves. This is the perfect beach location for families with small children or for people who enjoy a less hectic beach experience. The bay is quieter with less foot traffic and bikes so the little ones can safely play on the sand and along the peaceful water's edge. But, when your urge for action arises to meet the mighty Pacific Ocean you are only 150 steps from the ocean side and you can tackle the waves with your boogie board or surf boards. But, you will love coming back to the calm picturesque waters of the bayside. We take great pride in the presentation of the rentals and they are impeccably clean and well maintained. We are personally hands on and are within reach for any emergency which may arise. Our personal touch is what keeps people coming back each year. After 30 years in the business we are proud of our reputation care we provide. Each of our rentals are conveniently located close to restaurants, cafes, shopping, Sea World, the San Diego Zoo/Wild Animal Park, golfing, museums, plays and an amazing number of free activities. San Diego, America's finest city, draws the adventurous at heart from all corners of the world. Our unique accommodations are only minutes away from several of California's historical and greatest attractions. All our our Rentals are smoke free and pet free and in order to keep this rental in top condition, we do not allow it to be used for parties or gatherings. If you have a question about this policy, do not hesitate to ask. We strongly advice you look into Travelers insurance incase of a personal health emergency. Keywords: Condominium, Upper Scale, luxury, beach front vacation rental, waterfront, bayside, villa, beach vacation rental, condo, family friendly, Mission Beach vacation rental, San Diego vacation rental, vacation home, four bedroom, 4 bedroom, San Diego, places to stay. Your Hosts: Small personalized friendly hands on service is our business model. We have owned and managed vacation rental homes formerly 30 years. We provide hands on service, speak with each potential vacationer before reserving your dates and personally greet each vacationer upon arrival. We believe that selecting the right rental for your vacation stay is important and want to ensure that you are selecting the best rental for you needs. With a long time family history in San Diego going back to the turn of the century, combined with roots from the midwest, we have both pride in San Diego, and good old fashioned values. The rentals showcased on this site, reflect, our goal to provide you with quality accommodations, along with personal service from the start of your reservation process, to your final departure. We like to think we attract vacationers who appreciate receiving the exact rental that is advertised on our websites and desire a well maintained vacation home or rental that much care is taken to provide. In return, appreciate and care for the rentals during their stay and respect the quiet surroundings of the bayside. The environment we provide and the bayside in Mission Beach is a more low key area with an amazing location on the waterfront. 1. Its beach front property for #1. 2. Its gorgeous, well cared for and maintained to a higher level. 3. Its extra large by Mission Beach standards. 4. It actually has enough room for 12 people in normal beds, no hidden beds for you to have to use. There are very few homes in Mission Beach who truly have a large enough home to accommodate 10 to 12 people. What's not to love? Large Spacious Bedrooms, and home, are the key for this vacation home. Most rentals in the beach area, are a tight squeeze at best. The Great Blue Heron is a lovely vacation home, where you can have up top 12 people together, with out feeling on top of each other. One of the better choices for large groups who want to come together and spend time, but desire more space. 3 full baths, easily accommodates larger groups. For two mid-sized vehicles or one large vehicle only. Ask before booking. Yes all linens are provided for your stay. A gorgeous living room that looks out on the beach and bayside. This galley has all that you will need for cleaning up after your big crews meals. Stainless of course on the ship! Again only stainless on this ship! Odds and ends of spices etc. All that you will need for your vacation is provided. A gorgeous kitchen with a waterfront view of the beach and bayfront. There is seating combined in the kitchen and out side to easily seat 12, plus kitchen bar seating to accommodate 4. Your waterfront balcony looks right out onto the waterfront and Summer time, nightly fire works display. A large balcony for dining or sipping morning tea. Our home has a second floor balcony, that expands the 3/4 of the width of the front of the building, great space for dining. This is truly a lovely rental in every way. Everything you would need to have a wonderful holiday has been provided. When you choose The Great Blue Heron, part of the A Vacation By the Bay family owned vacation rental business, your experience is important to us from the start to the departure. With its large bedrooms and ample number of beds, you can really sleep 12 in beds as advertised. Great customer service is provided and personalized greeting upon your arrival is the norm. Exceptional, Clean, Great Location, Well Appointed, and Wonderful Host! What an amazing week we had in Mission Beach! This location is close to everything and while in the middle of a hopping beach town, when we were in the unit or down in front of it, it felt like our own little slice of heaven. The house was very large, bright, fresh smelling and clean, comfortable, and had every little thing we needed to feel right at home. We had our own parking spot (but be aware it is tight) and really came to love this beautiful area and home. Thank you Cyndi for being such a conscience host. We can't wait to come back! Thank you Milena for such a kind and wonderful review. Guest such as you and your family, are a gift to me. I never, ever take respectful, lovely guests for granted. My entire goal in this business is that you have a wonderful time and that the home was as presented. I would love to have you back anytime. In one word - PERFECTION!!! Having a few conversations and emails with Cyndi from the Great Blue Heron rental, I thought I knew what to expect, a clean nice house. Well, this was so beyond our expectations that I'm not sure how to let others considering this house know just how terrific our stay was. You know when staying at a rental or hotel that putting food on a counter or using kitchen utensils,etc isn't done without cleaning them yourself first, right? Well, I can tell you with that this rental was so immaculate when we arrived that we cleaned nothing beforehand!!! ( 2 staff clean from 9:00-3:45 the day you arrive) That included 10 of us with 2,3,7,9 year old grandchildren. I can't write enough superlatives to describe this wonderful stay!!! The location is perfect. Windows and balcony facing the bay, 2 parking spaces (a premium perk in California) full kitchen and two floors of nice size bedrooms with balconies, full modern kitchen with enough seating for all, and a living room with comfortable couches and large t.v. (used once for kids break time) We never felt crowded with 10. I researched for weeks to find the perfect place for our 1st full family vacation, probably about 50-60 hours altogether. ( I am admittedly obsessive about where we stay for our own vacations let alone vacationing with small children) It was so worth it because we got an amazing location, quiet bay waters and clean sand beach for the toddlers, a short walk to the ocean for less tame activities, and centrally located for all driveable attractions. The best though is conversing with Cyndi. She was helpful, accommodating, and genuinely cares about you having a memorable time at the Blue Heron . If you decide to rent here, make sure to spend a few minutes with Cyndi, it will be so worth it. The purpose of this family vacation was to create lasting memories and staying is amazing accommodations run by this special woman made a year of planning and every penny spent completely worth it. First let me express and say thank you for this spectacular review. You captured with your words and your experience, my goals, hopes and hard work for each and everyone's vacation experience to be for them. I loved having your family and especially meeting you and have some fun chats as well. I am so honored that you choose The Great Blue Heron for your families' gathering to spend that precious time together. I know how much it meant to you and that you and your husband, really wanted this to be a special memorable vacation. Your grand children will look back with found memories and you and your husband have this family time to hold close to your hearts. Thank you again Kathy for giving me back with your words such a warm and appreciative gift. And to top it off, your 50th anniversary copy of "To Kill A Mocking Bird" Novel, was so very special, as you know, in so many ways to me. This is why I still do this work after 30 years. We loved being front & center on the bay. We had most of our family join us for this week long trip to the beach and the house handled our large family extremely well. There was room for all of us to have our own private space and the living room, kitchen and deck were spacious and fully decked out with everything you'd need for a week's stay. We spent a number of days on the pacific side with the waves and it was only a short walk from our unit. We would definitely recommend this. It was a pleasure to have you all and for a large group, you could not have been better guests. Anyone would be honored to have you all stay. Lots of fun! Fantastic 4th of July week! This was our dream vacation from the moment we booked. The contract, communication and detail instructions was foreshadowing of how amazing this rental would be. From the moment we opened the doors I knew THIS was our forever destination in San Diego. This particular rental was in the perfect location on the bay and only a few houses away from beach side. It was perfect for quiet days in the waters of the bay OR action filled days in the ocean surf. The home itself was nicely equit AND was absolutely gorgeous. You can tell the management/owners take pride in offering these rentals. I'm so excited that we've found such an awesome place and made a new friend in Cyndi! We even made friends with people below who have rented from her for years and a man on the corner who owns but rents from her when extended family comes in town! Do NOT waste your time looking anywhere else... book this location now! Ideal location for both young and old. We loved our stay. Walked to Belmont Park every day. Plenty of room for all 9 of us. Young kids loved the bay while the older ones walked to the ocean every day. San Diego Zoo and Safari Park close by and worth visiting. To have the whole family together and create memories was awesome! The Great Blue Heron Vacation Home, is located in the heart of Mission Beach on the bayfront. We have an excellent location over looking the beach bayside. Its a great fit for large families and provides great space for staying comfortably. Other Activities: Rowing, Stand up paddling just to add to your adventures while you vacation. Please inquire and ask questions before booking via the HomeAway/VRBO site This home is a perfect fit for respectful guests. Its large, gorgeous, and sits right on the beach front bayside. After booking, you will receive the official contract for your final step. It will be shared and initialed by all adults 18 years of age and older. Then, the guest who reserves, and makes the payment must completed and sign the contract and send the full contract back to me with a copy of a government ID. The reservation name, the payment name and the ID must all match. Please feel free to send an inquiry before requesting to book. We love questions. Reservation and Payment information: (Rates are subject to change until reservations are confirmed We reside next door and are here should you need us in an emergency. We greet you personally and give you a quick tour of the property to familiarize you with the home. This home is located in a quiet ares of Mission Beach and we have a policy of only the guests on the contract at the home. If you have a question, about that policy or anything about the home, please ask, as we would love to answer any questions you may have.